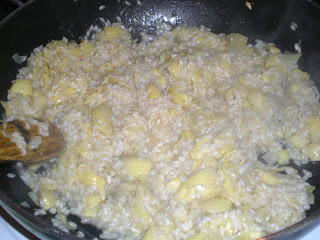 Those of you who tasted risotto know how simple is to make one and any flavour can be put on it. So, I showed my good friend Tony how to make one. 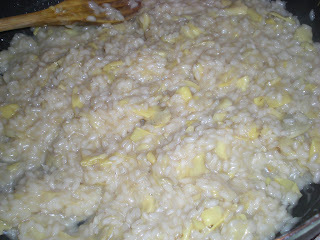 In the past, I wrote two risotto recipes : Blue Cheese Risotto with Prosciutto and Cremini Mushroom Risotto. This time, I wanted to try artichokes since it is an ingredient I never used before and it seems it goes well with pesto. Unfortunately, fresh basil is unavailable this season so I went for store-bought pesto. 2. In a large skillet, heat oil and melt butter over medium-high heat. Cook onions until transparent, about 5 mins. 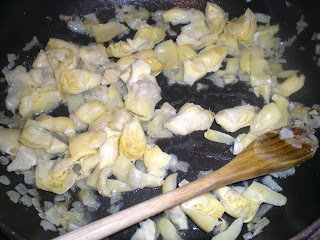 Add artichokes and cook until golden brown, about 3-4 mins. Add garlic and cook until fragrant, about 1 min. 3. 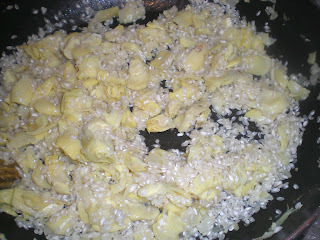 Add rice to skillet. Leave for 3-4 mins until almost translucent. 4. Add white wine and a ladle of broth. Let the rice adsorbed most of the liquid before adding more liquid, stir constantly. 5. Continue in this manner until it gives a creamy consistency but still retains a bite. If stock runs out, add water. For a richer taste, add butter when it becomes creamy. 6. Remove from heat. Stir in pesto and lemon juice. Add parmesan before serving. 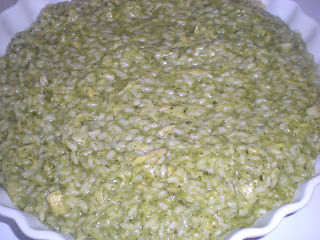 the risotto looks great! I'm sure the artichoke flavors are really tasty! I think artichokes would be wonderful in risotto and I like the flavor combination with the pesto. Looks great Victor! I bet the Pesto gives it a nice flavor. I have a King Crab Risotto dish that uses artichoke hearts. Give it a go sometime if you are into cooking with Aborrio Rice. Love this combo of "green" ingredients! :9 the pesto just makes it go heavenly!!! See, it wasn't that hard to make risotto...Capers must taste good also.